Water damage is one of the most prevalent types of losses in the claims and restoration industry. Water is the root of many different types of losses, depending on the nature of the release. Water intrusion is typically the slow seepage of water beyond the drainage plain intended for its use in exterior cloutings and wall systems. Water will seek its own level and can be steered by building pressurizations, allowing water, in some cases, to be pulled from the exterior to the interior of a rain screen system. Water, as a sudden occurrence and released from a closed system, is typically a first-party claim. In every occasion water and cellulose, along with ubiquitous mold in our built environments, will combine to create mold. Mold is the result of water seepage or release into unintended spaces. In all instances, until the source of the water is remediated, any attempts to repair the resulting damage is futile. The combination of drying, application of mildewcides and controlled demolition are key to resolution of water damage losses. Water Intrusion – These are properties that have become damaged as result of the seepage of water typically propelled by air pressure. Air pressure can either be negative inside a building pulling water in through bad flashing or positive from wind pushing water into the building. Both are bad and, with the use of cellulose building materials so prevalent in the U.S., they can cause extensive damage to the interior components of a home or business. Oriented Strand Board is a great example of a product uniquely susceptible to water damage, mold and rot. Rot is simply water damage that has developed over time, resulting in the hyphae being absorbed and breaking down the cellulose product. Water Loss – This is the name for a claim that is just that… a water loss. Typically, these are straight forward losses as long as the owner, or some person, is available to mitigate the damages as they are known. The only time a water loss will get away from you is when the property is vacant and then the loss can become something more. We have seen instances where as much as 50,000 gallons of water are let go from a burst pipe and the leak goes undetected. In one instance we, saw a pier become unstable due to the draining of the water under the house – Big damage from a little problem. Complete, Inc. is a licensed, general contracting and construction consulting firm that specializes in the resolution of water damage claims throughout the Southeast. 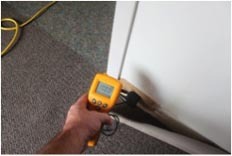 We use FLIR thermal imaging and GE moisture meters to map the water in a property. Our job is to confirm that a property is dry or find where the water is and where it is not. Call the company the pros choose, call Complete.